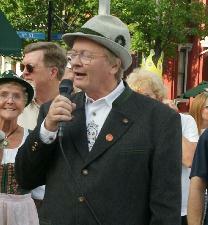 October is German-American Heritage Month, and this year marks its 21st anniversary. Proclamations have been issued in the past by the governors of Ohio, Kentucky, and Indiana and it has been recognized by the Ohio historical organizations as well. And since 1989, I am proud to say that the German-American Citizens League of Greater Cincinnati has sponsored the month in the Greater Cincinnati area. German-American Heritage Month takes place in October as it is centered on German-American Day, the 6th of October, the date on which the first German settlement was established in America at Germantown, Pennsylvania. It was officially declared German-American Day in 1987 by President Reagan. Feeling that one day was not enough to cover German contributions to the Cincinnati region, the German-American Citizens League founded German-American Heritage Month in 1989 and has encouraged its celebration elsewhere. Since that time, other places have followed suit. For example, this year, New York City celebrated the month as well. We hope that other cities and states with a strong German heritage will also join in celebrating German-American Heritage Month. This year programs will be sponsored by Northern Kentucky University, Kenton County Library, Public Library of Cincinnati & Hamilton County, Hamilton County Genealogical Society, and the German Heritage Museum. Just think what the Greater Cincinnati area would be like without its German heritage. Without the German heritage, the area would be an entirely different place and look quite different – no Over-the-Rhine, no German brewing heritage, no goetta, no Oktoberfest, no MainStrasse Village in Covington, etc. Many things we accept as part of everyday life in the Greater Cincinnati area would not be here. Cincinnati’s first Mayor was Major David Ziegler, a veteran of the American Revolution and during the Civil War, German regiments were formed for the Union Army. These and many other facts will be explored during German-American Heritage Month. German-Americans helped build and make the area what it is today. German-American Heritage Month is the time to not only celebrate this history, but also learn more about it. A full list of the events taking place during German-American Heritage Month can be found on the German-American Citizens League’s website.